Gary Taubes’ bestselling book, Good Calories, Bad Calories, starts off with the story of William Banting. Banting tells his tale in his late 1800s release titled Letter on Corpulence, Addressed to the Public. It started as a pamphlet and turned into a best-selling book with multiple editions. In the low carb community, Banting has been proclaimed as one of the first low carb gurus. He is often cited in works ranging from Taubes to Atkins. For dinner, at 2.0 P.M., Five or six ounces of any fish except salmon, herrings, or eels, any meat except pork or veal, any vegetable except potato, parsnip, beetroot, turnip, or carrot, one ounce of dry toast, fruit out of a pudding not sweetened, any kind of poultry or game, and two or three glasses of good claret, sherry, or Madeira — Champagne, port, and beer forbidden; making together ten to twelve ounces solid, and ten liquid. For tea, at 6.0 P.M., Two or three ounces of cooked fruit, a rusk or two, and a cup of tea without milk or sugar; making two to four ounces solid, nine liquid. For nightcap, if required, A tumbler of grog–(gin, whisky, or brandy, without sugar)–or a glass or two of claret or sherry. On this diet, Banting stated he lost 50 pounds to land at roughly 150 pounds. He claimed to have sustained that loss, give or take a couple of pounds, for many years. Low Carb Diet or Just Low? Banting was 5’5″ and weighed 200 pounds. That would give him a conservative BMR of 2,000 calories BEFORE activity. We have only Banting’s anecdotes to determine his activity factor. He thought highly of his movement despite being in a retired state. He noted manual labor and horseback riding among his activities. Being that most overestimate their activity, I am going to go with a conservative activity factor of 1.40-1.45. This leads to an estimate of 2,800-2,900 calories for Banting’s TDEE. Any intake less than this would move him into a possible caloric deficit. Based on Banting’s own diet accounts, his highest caloric days seemed to top out at roughly 1,700 calories in which 300-400 were from alcohol. His macros tended toward a low to moderate fat and carbohydrate intake relevant to calories with the highest allotted towards protein, though only slightly. Without taking into account metabolic adaptation or human error, Banting was hitting an average daily caloric deficit of roughly 1,000 calories per day or 45% of his intake need at the beginning. This is likely to have slowed as time went on (which makes sense in his weight charting). It doesn’t seem he took part in refeeds or breaks. But this is all speculation anyway which is kind of the point. I’ve provided you with a modernized visual of Banting’s diet. I made the best assumptions possible based on the information provided. It was clear (by the limits of the meats listed) Banting was told to stay away from meats high in fat (“Meats except pork; fish except for salmon”). He also writes about fat being skimmed off of food he eats in later updates. You will note though, I still used meats with moderate saturated fat as might have been in the mutton and chicken breasts with skin. Is there a chance the fat content of the meats could have been a tad higher? Sure, but it could have been lower as well. I also used the highest number of ounces listed. I feel this is a good snapshot given the available information. You will also note that starch intake was not absent. Vegetables were more scarce, but starches were consumed as well as fruit. Maybe some couldn’t tell because they are listed as “toast” or “rusk?” Those items are made with flour, in case you were wondering. This really isn’t a “low carb” plan so much as it is a low calorie plan. I mean yes, technically it is lower in carbohydrates than what the average American eats, but so are the calories. The macros are almost split down the middle with a little alcohol. What type of diet does that sound like? Seems closer to Mediterranean diet macronutrients to me. It makes me wonder if the experts took the time to log what Banting had written down. It makes me wonder if Banting understood it himself? What about the statements he made claiming he had “tried it all” before this diet? Let’s look at his own statement regarding his previous diet. Very low protein, very high carb, moderate fat. We don’t get specifics on ounces, but it’s easy to conceive that Banting was packing calories away in the form of lots of sugared teas and pastries. There is no denying his previous diet was low in nutrition and high in calories. I was amazed by how the book Good Calories, Bad Calories is filled with references but somehow missed adding up the calories and macronutrients. Why were statements made that went directly against the diet being discussed? The above isn’t what Banting did. He had small amounts of all macros, the highest of which was protein, and a generous amount of wine (in comparison to his overall caloric intake). He had limited intake of low fat meats and low overall calories when compared to his total caloric need. He had starches, flour, and fruit. He had restrictions on the type of fish and meats he could eat. So writing the phrase, “Have as much as you would like!” is not only a non-factual statement about the diet being discussed, it’s unhelpful to the reader and can actually lead to gaining fat instead of maintaining or losing it. Eating as much as you want of any macronutrient is going to lead to fat gain the moment the energy balance is tipped. If you want to have some fun, enter copious amounts of cheese, meats, veggies, and eggs into a food database and see the number of calories it spits out. If your argument is that eating as much as you want shouldn’t be taken literally, then my response is don’t say it. Even trained athletes who work with nutritionists have a hard time understanding nutrient and caloric intake; the average adult performs much worse. Calculating activity expenditure in hospitals by professionals is also a difficult task. In short, when the professionals have a hard time targeting energy balance, do you think it’s wise to make prominently placed statements like, “Eat as much as you want,” to lay readers? I think it’s asking for troubled and frustrated readers. To be clear, I don’t care at all about Banting’s daily diet. It’s hardly the worst thing I have ever seen and appears to have allowed the man to finally tackle some of his weight issues. Good for him. Could he have maximized nutrient intake? Sure, we all can. But it obviously helped his personal lifestyle with compliance. And that is all that matters. The problem is that his personal diet didn’t stop with him. Instead, it was printed, spun around, translated into multiple languages, hyped, marketed and let to people’s misconceptions. Since then, others have used his words to do much of the same. The problem is that his diet, as with most diets, wasn’t prefaced with, “I’m not sure why this worked for me, but it did! Maybe it can work for you too. Maybe one day someone can explain why.” I can tell you why. Banting was eating 1,700 calories per day and was, for a time being, a large adult man. With some* in the low carb or Paleo community, we find statements about isolated events or small populations meant to be applied to larger populations. Eskimos or Inuits are a popular group often cited for how we should pattern our behavior, but their lifestyle and living conditions are in no way comparable to the majority of the world. Call me simplistic but large scale studies done with the highest number of individuals possible is usually the best course of action. Though still rife with problems and research issues, we can learn a thing or two about free living intake. What do we find from examining diets for optimal longevity, health, and happiness? We find diets that focus on a moderate intake of all macronutrients with regular light exercise and activity. We find a life that preaches moderate restrictions and heaping doses of enjoyable outdoor and social activities. We don’t see a lot of positive outcomes when you tell people to fear, restrict, and abolish. It’s bad science to preach restrictive eating. There is nothing wrong with still looking for answers and optimizing dieting and training systems. But in these investigations, why would we try to model our lives after those with illnesses or extreme living circumstances? Would it not be more fitting to find comparable counterparts? We see this time and again with arguments about the intake of gluten, nuts, and dairy. Because a certain population subset has very real and extreme difficulties digesting certain foods, it must then be bad for everyone else? This is a logical fallacy and fear mongering at it’s worst. Dietary intake is varied and complex in how it affects individuals. It becomes even more complex when trying to manipulate body fat or health. It’s crucial you guide by logic and facts over fear and anecdotes. When you read anyone’s diet story—think critically. There is always more to the situation than what is condensed into a 30 minute promo. Be it Banting, Taubes, you, or me…if we want to lose fat there is one thing we must all do. It doesn’t matter if it is IF’ing, Paleo, South Beach, Atkins, Lemon Cleanse—they are all creating a deficit. The only way you will lose fat is if a deficit is created. Maybe an author does it with points, clean foods, or no carbs. Maybe they focus on training the deficit out of you. But in the end, a deficit has to be created. Your job is to figure out the easiest way to create the deficit for yourself. Your job is to find a diet or program that will help you sustain a deficit. Your job is to find a dietary system that will allow you to maintain your weight. These things may not always be the same thing. For example, I may choose a different dietary approach for myself in meal timing and restriction than I would in a maintenance state. When you understand the purpose of all diets, you can start to see through the code of fat loss (and sometimes the BS). *Authors note: The word “some” was used for a literal reason. Not all low carb advocates subscribe to irresponsible reporting of research or discount energy balance. I call some of them friends. Update #1 – There will be few additions to this article due to discussion in the comments and on Facebook. In the meantime, Evelyn at “CarbSane” tackled this Banting issue a while back. Hop over and check out her thoughts. 3. Am J Prev Med. 2013 Nov;45(5):615-21. doi: 10.1016/j.amepre.2013.06.019. Overstatement of results in the nutrition and obesity peer-reviewed literature. Menachemi N, Tajeu G, Sen B, Ferdinand AO, Singleton C, Utley J, Affuso O, Allison DB. 4. Br J Nutr. 2009 Jul;101 Suppl 2:S73-85. doi: 10.1017/S0007114509990602. control and adjustment methods in practice. Poslusna K, Ruprich J, de Vries JH, Jakubikova M, van’t Veer P.
Palackého 3a, Brno 61242, Czech Republic. 5. Nutr Rev. 2006 Jul;64(7 Pt 1):319-30. Underreporting of energy intake in developing nations. Scagliusi FB, Ferriolli E, Lancha AH Jr.
6. J Nutr. 2003 Mar;133 Suppl 3:895S-920S. Markers of the validity of reported energy intake. 7. Am J Physiol Endocrinol Metab. 2001 Nov;281(5):E891-9. Evaluation of dietary assessment instruments against doubly labeled water, a biomarker of habitual energy intake. Department of Nutritional Sciences, University of Wisconsin-Madison, Madison, Wisconsin 53706-1571, USA. 8. JPEN J Parenter Enteral Nutr. 2009 Mar-Apr;33(2):168-75. doi: 10.1177/0148607108327192. Comparison of resting energy expenditure prediction methods with measured resting energy expenditure in obese, hospitalized adults. Anderegg BA, Worrall C, Barbour E, Simpson KN, Delegge M.
9. J Am Diet Assoc. 2005 May;105(5):775-89. Comparison of predictive equations for resting metabolic rate in healthy nonobese and obese adults: a systematic review. Frankenfield D, Roth-Yousey L, Compher C.
Department of Clinical Nutrition, Milton S. Hershey Medical Center, Hershey, PA, USA. 10. Curr Opin Clin Nutr Metab Care. 2005 May;8(3):319-28. Can measured resting energy expenditure be estimated by formulae in daily clinical nutrition practice? da Rocha EE, Alves VG, Silva MH, Chiesa CA, da Fonseca RB. I so enjoyed this article. I am a Paleo eater and make sure when talking to people about it that I am clear that the reason Paleo works is because it reduces your overall calorie intake. Breaking the blood sugar cycle by eliminating empty sugar & bread calories, eating nutrient dense foods, and consuming adequate protein and fat simply make the bodies total food intake needs (and cravings) lower. I do eat freely within the framework of Paleo, including plenty of starchy veg and fruit and maintain a healthy weight (5’2″, 122lbs, 24% BF) nearly effortlessly. I have eaten Paleo for 2 years now and experience the same. I have no cravings, my energy lasts all day, I eat when I am hungry, but I eat plenty and have excellent sleep now. In fact, I am eating more and better than I ever have and my weight is stable, after losing a lot of belly fat and even my cellulite! I have a history of eating disorder and binging, depression and other, frankly, horrors along with anxiety and OCD. Eating this way has transformed my life–this is simply REAL food, no processed food and sometimes full on organic, but not always. Good meat, eggs, veggies, coconut oil (Yum!) real butter and seeds, fish, cheese and yogurt now and then and I don’t stint on any but NO wheat and grains because I have found I am sensitive to them.The freedom from binging, much less anxiety, no depression, lower body fat, normal blood sugar and thyroid, general well being and my joints/arthritis pain is gone has been a revelation and a blessing. I feel I am eating like humans were meant to eat. But, each to their own as folks are wedded to their processed foods, even to their detriment and being conned by Big Food, Big Pharma and the govt., which is owned by the first 2. And THIS is the book all the “carbs are bad” people keep telling me I need to read. Such hard science and convincing evidence. Disregard the millions of people throughout history and still today who maintain a normal weight and good health on a moderate to high carb diet… here’s a couple of stories about select individuals who lost weight by cutting carbs. In actual fact they’ve merely gone from an excessive amount to a not excessive amount… but regardless, a relatively small amount of people who might need to limit carbs for medical reasons does not mitigate the overwhelming majority who thrive without adopting such unnecessary restrictions. The promotion of these “carbs are killing you” fabrications by Taubes and his minions is both dangerous and moronic. Then why does it seem to work in the hundreds and hundreds I read about daily on blogs, podcasts, books, etc and myself. Something is very wrong with the “advice” we have been getting since the 1970’s and consequently from then on a huge rise in diabetes, heart disease, autoimmune disease and the whole host of terrible health problems taking a terrible toll. Why is real food now, since the 1970’s somehow bad for us, when humans have been eating it for millions of years? By real food, I don’t include bread, wheat, soy OR corn and veg industrial oils like canola and margarine,corn oil etc. since they are either GMO or hyper-hybridized or treated with poisons to get us to put it down our gullet like diesel fuel when we need gasoline as an analogy. Soy might be helpful, or was, until it was added to almost all the food processed in this country and attending issues follow. Same with wheat and corn. The situation is changing, but not fast enough for me and millions. The argument of success with regards to low carb/high carb/low fat/paleo/(insert any other dogmatic approach) is really focused on anecdotal evidence. I can find success stories in plenty for any approach. Most people administering metabolic protocols can note that they too have witnessed people lose weight on all the above; however the common link is that their dietary refinement & commitment has led to caloric restriction; knowingly or unknowingly. I won’t argue that Paleo isn’t a great choice once you move past the misinterpreted paleolithic research as to what humans were “meant” to it (whatever that means) or the zealous fanaticism associated with it. At this point, metabolic ward studies do offer us the best scientific view of the metabolism and the strong evidence that calories do in fact matter. I’m not so sure the Paleo’s invented anything that wasn’t already common sense, but it certainly has driven people to eat less processed which is fantastic. Keep up the good work Leigh. you seem to have misinterpreted my comment. I’m not saying you CAN’T lose weight following these restrictive diets and that the foods they recommend are bad. I’m just saying that for most people under normal circumstances, such restrictive measures are not necessary. Leigh, I may have caught a math error in your table. Fats provide 9 cals/gram, proteins and carbs = 4 cals/gram. 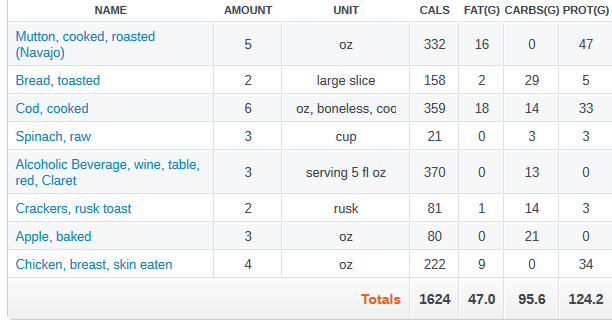 Assuming the carb grams you list are non-fiber, the total calorie count I come up with is 1276, not 1624. If anyone sees my error, please comment. “I entered Banting’s diet into my nutritional software and it came up to 1925 calories, 101gr carbs, 8gr fiber and 128gr protein, 34gr fat. I used 5.5 oz when he said 5-6 oz, and did add 3 oz brandy for his “tumbler” of grog which he said “if required”. The total oz for his wine and brandy is quite high, at 20! YUM! Here is how I personally interpreted the alcohol consumption. In the listing, he gave liquids in ounces mixed with teas and waters. He put, “For supper, at 9.0 P.M. Three or four ounces of meat or fish, similar to dinner, with a glass or two of claret or sherry and water; making four ounces solid and seven liquid.” I am assuming/wondering if the alcohol content here was very small. Only a few ounces and mixed? That was how I interpreted it anyway. If not, then yes I think saying a slightly higher caloric intake would be correct. To me the range for alcohol makes more sense at roughly 15-20oz a day. I charted him at 15. But, I can see room for a larger range if that is not how it should have been judged. He makes mention of after his initial weight loss of green peas and states that he allowed himself to have them in small amounts but went up in weight when he did so. He stated he would always drop back down when they were out of season. He also wrote of skimming fat off of items. Fat restriction seemed pretty aggressive. Thanks a lot for linking to Evelyn, I didn’t realize she tackled the issue, but am hardly surprised. She is always pointing out very logical assessments like this. I will throw up a few alternated calculations/chart tomorrow evening. Thanks for the comments, Steven. You got me thinking as well Steve, that this brings up an even better point. Looking at Evelyn’s reasons, I think they are completely sound (obviously, she is great). But, I think my reasons and selections are sound too. A sherry glass is usually 3-4oz. It wasn’t as if this guy was loading up a full wine glass. The way he described it, and the liquid ounces listed, it seemed more like 3x3oz = 9 not 3×5 = 15 (for the one meal). But, my point is, it’s an assumption. We are all speculating. I also got into a similar conversion on facebook and it felt silly to argue over this mans meals when 1. it’s only a sample he provided and 2. it’s a free-living diet record. How notorious are all those for being wrong? That’s kind of the point of the article in a way. My assumption (my Professor Plum, in the study, with the lead pipe) is that his calories were on the lower side in the beginning, and activity factor dropped overtime (would make sense to his weight logging). He certainly later was more lax with intake, but still pretty strict. I can’t imagine he had a lot of refeeds or high days period, but certainly not during his time of initial loss. With those numbers trending so well, the caloric intake would have to be pretty low especially considering it wasn’t a crazy restriction of carbs (just overall calories) and he only gained a few pounds when they got higher in brief bits later on. I’m just flowing thoughts right now, but I feel (at least in the beginning) he was in a more significant deficit. This gives me an idea of some thoughts/updates to the article though, so I appreciate the comments. Also, forgive if there is horrible grammar/errors. It’s very late here, but I just wanted to respond cause my day is packed tomorrow till the evening. Leigh, you must be right that the “hidden” calories I missed in my calculation are from the alcohol. Pure alcohol provides 7 cals/gram. I should have caught that! I have confidence in your total calorie count. I’m surprised you are endorsing carbsane. She is a hatefilled obese stalker whose sole purpose is to trash low carb and paleo proponents. All the while she trashes the likes of eades ,wolff,Moore,sisson taubes and many more while she has never posted a pic of herself. While you have the right to say she is terrific, she, unlike the above names, has never helped anyone get healthy or lean, especially herself. I am not aware of her personal squabbles with any of those people. I tend to stay out of the drama and focus on the work. I’ve known of a doctor (putting it lightly) who tried to diagnosis her (shamelessly) via a blog, but that’s about it. While I’ll admit, I have not read a large amount of her work, the work I have read was solid and looked at great research data. Evelyn is just telling it how it is and a lot of low carbers, paleo folks don’t like that. She brought attention to some inaccuracies with Taubes stuff and it was not appreciated. Ron Stone you have it wrong. I hope you didn’t infer that I thought you were attacking Taubes, I don’t. Criticism is one thing, but stalking, constantly degrading, etc, especially when one does not have a handle on their well being is something entirely different. You are an example of someone who helps others to lead a happy healthy existence instead of just crtiticizing. “Ron Stone” — Can you please give me an example of where I’ve misrepresented the science or discussed someone’s personal life in an irrelevant manner? No. Because I don’t. I don’t stalk people, though I have been stalked. There is a clear difference. I have helped a lot of people by discussing the scientific evidence supporting and/or refuting many claims. Your laundry list of names doesn’t like this. So they, like you, attack me personally. I have not done that to them, though when attacked I have fired back at times. The only time I’ve even made personal things an issue is when they are relevant. As in a diet doctor claiming LC is the be-all and end-all cure for obesity should not require the wearing of a girdle for TV appearances, and a “weight loss success story” ought to be honest about the limits of the success and ongoing issues. I don’t know who you are or what your deal is, but your commenting here is kinda creepy. How about the Dukan diet? One loses weight very fast on that diet, with lean meat, only 1.5 tablespoon of oats and e.g. egg/salmon omelet. Weight loss is very fast. Though the high protein consumption does tend to cause dehydration, therefore not reccommended for extended periods of time. Have you looked at No Sugar, No Grains (http://vinnietortorich.com)? A high fat (& protein) diet, the high fat content of the meals does allow one to keep going for a while, without crashing. And I was wondering: insulin is known to be a fat-depositing molecule, triggered by carbs (which is why lower-than-usual-carb will make you lose fat, no-carb is ilkely bad for you), but what is the same molecule triggered by fat and protein (surely those macros, adding to your caloric intake but not triggering fat deposits (how could it? Name the insuline-like molecule for protein and fat). BTW, you might want to ook here: https://www.facebook.com/groups/434957346580399/ Vinnie Tortorich’s No Sugar No Grains (a FB group devoted to the NSNG lifestyle, and a group where people try ot eliminate consumption of sugar and grains), there’s also a vegan group, called Plant Powered NSNG. People who do stay lean and capable of finishing a triathlon (not me though). Oh, and what about fruitarians like Michael Arnstein? He eats 6000 calories (Ìmpossible: must be 6000 KILOCalories) in fruit + veg alone and he’s incredibly slim and also a fast marathonrunner. http://www.youtube.com/watch?v=KE5Z1gKiD1s And those 6000 Kcals should get him enormously fat, shouldn’t it? Wouldn’t a macro-based view on fat loss be best? Sure, caloric restriction does work, but it makes you feel bad and imposes health risks. And it’s most definitely not the only weight loss diet that works, and this kidn of weight loss diet has a finishing line, and is not a lifestyle diet (dictionary definition of diet) that can be kept up forever. What a disappointment. I was really hoping that jazz hands would be the answer. Helpful analysis, thanks for your efforts doing this. You are an outstanding resource and a treasure. Eating 6000 Calories might not necessarily mean *absorbing* 6000 Calories. If a large amount of the food is vegetable, I’d wonder how much of that energy is being wasted either as energy to digest the food or as literally pooping out as undigested waste. Aren’t there diet pills that do that too? They bind to fats and you wind up with diarrhea from the unabsorbable stuff? Or illness-wise there’s people with Crohn’s disease or Ulcerative Colitis that when the illness is running strong they wind up having all their food rapidly run through them and thus they have a difficult time maintaining weight because they absorb so few nutrients. That’s also where things like taking ice baths and other similar things that make it take a lot more energy to maintain body temperature can also use up Calories without them showing up on a “did this much exercise” chart. I think I have read that healing from injuries like severe burns also uses up a lot of Calories. I’d consider both of these to be among the less pleasant ways to create an energy deficit (along with the Crohn’s disease of which I have personal experience). Energy balance means looking at everything going into the system and everything going out. I do not believe Calories magically disappear, but they can seem to if they are flushed down the toilet or used to keep warm. Hi Leigh! Thanks for the shout, and great article! I have never had a weight problem due to my high metabolic rate and I probably averaged 600g (1.3 lb) of potatoes, half a large loaf and 200g of raw oats per day for 58 years and had a prodigious appetite and a very sweet tooth. At 74 my glucose level went into Type 2 so I whacked my carbs and fruit juice. This took me back to high normal but I lost 5 kg in a month, which I didn’t want to. Started on the Banting diet since the New Year but with a minimal bread/potato addition. Will see how things go when I get another blood test. I enjoy the banter on the site but some of it gets too personal.